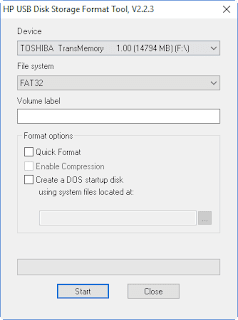 HP USB Disk Storage Format Tool 2.2.3 is a Windows based format tool. 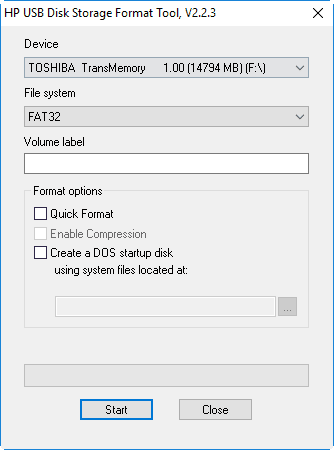 It can format and repair any USB Pen drive in FAT, FAT32, or NTFS file systems and also creates DOS startup disks that can help boot a PC . HP USB Disk Storage Format utility is a free portable software designed to reformat HP USB flash drives and Disk on Key USB devices .It is a portable software so no need to setup it in your Computer .You can format your corrupted USB flash disk in FAT32 , NTFS and you can make a bootable flash drive . You must open HP USB Disk Storage Format tool v2.2.3 with administrator privilege "Run As Administrator " .This tool is very easy to use and you can copy it to your USB flash drive .This software can create a FAT32 Partition or Volume with 32GB size .Hp USB disk storage format tool 2018 software support Windows Xp , Windows Vista ,Windows 7 , Windows 8,Windows 10 .